MUNICH (Bloomberg) -- Volkswagen Group's global workforce of 600,000 employees is starting to feel the effect of the diesel-emissions scandal as the carmaker cuts spending in anticipation of fines, recalls and a drop in U.S. sales. Volkswagen slowed production at one of its biggest engine factories and froze hiring in Germany at its unit that handles car loans, the company said today. More measures to curb spending are expected as VW seeks to weather the crisis by giving its efficiency program a "turbo" boost in the billions of euros without cutting jobs, Bernd Osterloh, VW's labor chief, told workers in a letter on Sept. 24. 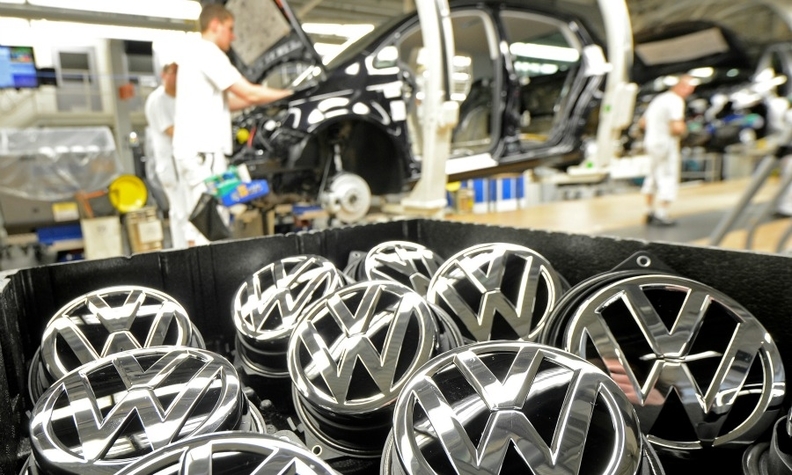 In Salzgitter, Germany, where about 7,000 workers turn out about 1.58 million engines a year for everything from Bugatti supercars to the mass-market VW brand, Volkswagen dropped one extra shift a week because of the diesel scandal, spokesman Christoph Adomat said. At the financial services car-loan unit, spokesman Stefan Voges said Volkswagen froze hiring in Germany through the end of the year and told 29 temporary workers they won't have their contracts extended. The automaker is facing a significant financial hit, including at least 6.5 billion euros ($7.25 billion) it already set aside for repairs and recalls and a U.S. fine that may reach $7.4 billion, according to analysts from Sanford C. Bernstein. "Volkswagen has a broad range of options should they need to boost liquidity," said Frank Biller, an analyst with LBBW. The company could try to step up the VW brand's existing cost-savings program, which had originally aimed to boost earnings by 5 billion euros by 2017, he said. "Then there's a catalog of measures that could follow." These range from shrinking ad and sponsoring budgets to reducing bonus payments, cutting the dividend or selling assets, Biller added. Volkswagen had 21.5 billion euros in net liquidity at the end of June and since then sold shares in former partner Suzuki Motor Corp. for about 3.4 billion euros.